Currently, reverse osmosis technology is one of the best water filtration technologies. The reverse osmosis faucet is a helpful water treatment system that will allow you maintain your residential need. Additionally, this system is effective for home appliance works and it will increase the quality of household water. 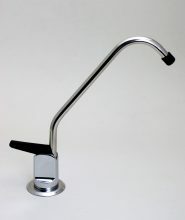 Besides, the reverse osmosis faucet is able to remove a wide range of toxic elements along with impurities from water. In addition to this, you can install the reverse osmosis faucet in the kitchen and when water is treated through the faucet, the water will be completely safe for multiple uses. Bad taste or odor: Unless, you replace the system, the reverse osmosis faucet will provide water with bad taste quality. The reason for this is that the carbon filter is out of date after extensive use. A. Inaccurate water flow: When the reverse osmosis faucet becomes one or two-year-old, it might provide water with an inaccurate flow. The overflow of the drain water: The overflow of drain water can occur for clogged air gap. In that case, you need replace the faucet. Milky colored water: After using the system for a long time, it might provide you with milky colored water. So, in this situation, you need to replace the reverse osmosis faucet. First of all, you have to turn off the feed water supply valve to the reverse osmosis filter. Also, you will turn off the storage tank valve. In the second step, you will turn on the reverse osmosis faucet for releasing the water pressure and after that, you will turn it off. Now, you will remove the tube from the faucet adaptor and also, the faucet adaptor itself. In the next step, you have to remove the washer and the nut from the faucet from the under sink. Next, you will need to pull the reverse osmosis faucet in the upper direction and move it out of the hole on top of the sink. Next up, you will again insert the tube back to its original position in the faucet adaptor. You are in the last stages of the process where you will turn three things – storage tank, feed water supply valve to the filter, and reverse osmosis faucet to wash out the tube of the air. Finally, you will just turn off the reverse osmosis faucet and check for leaks. Your work is finished and you have successfully replaced the reverse osmosis faucet ! !